Nabarangpur-Online: Four Leopard skin, One live Pangolin seized six held at Nabarangpur. Four Leopard skin, One live Pangolin seized six held at Nabarangpur. The officials of the Nabarangpur forest division seized four leopard skins, one live Pangolin and arrested six persons from Kosagumuda border to Chhattisgarh.The District Forest Officer Swayam Mallik, said that the officials were acting on a tipoff that some men from Chattisghar and Nabarangpur were trying to sell leopard skin. 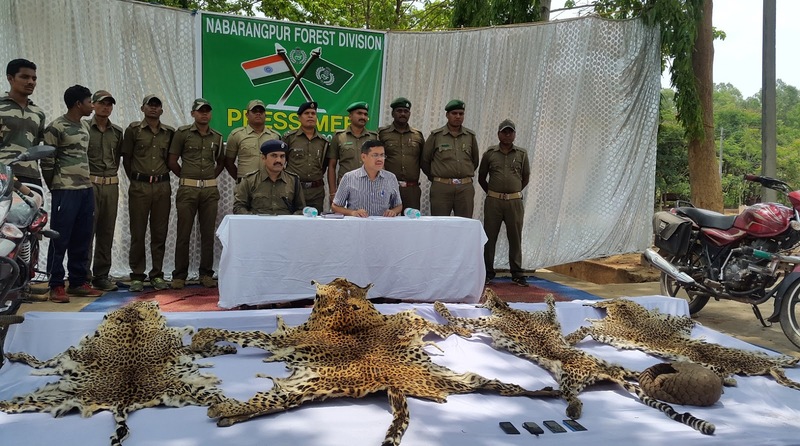 “We formed a special team led by range officer Dhanurjaya Mahapatra, with forester Jagannath Prasad Bissoiy, arrested four poachers of Chattisghar, and two from Nabarangpur district, with the leopard skins and live Pagolin, from their possession. The forest officials also seized four motorcycles, four mobile phones from the accused persons. The leopard and pangolin are schedule-I animals as per wild protection Act, 1972, Mallick said four cases have been registered and six accused have already been forwarded to the court of Sub-divisional judicial magistrate, Nabarangpur, Mallick added. It is pertinent to mention here that during in the month of February six leopard skins, tiger and bear teeth as well as a bear paw had been seized by forest official and arrested five persons from Indravati hydro project area at Nabarangpur-Kalhandi border. Similarly during May 192 live Indian Soft Shelled Turtles had been seized at Chandahandi by the forest division officials of Nabarangpur one accused had been forwarded to the court. The work of Nabarangpur forest division is in consonance with this year’s theme of world environment day celebration, i.e. “fight against the illegal trade in wildlife for live” Zero tolerance for the illegal trade in wildlife.